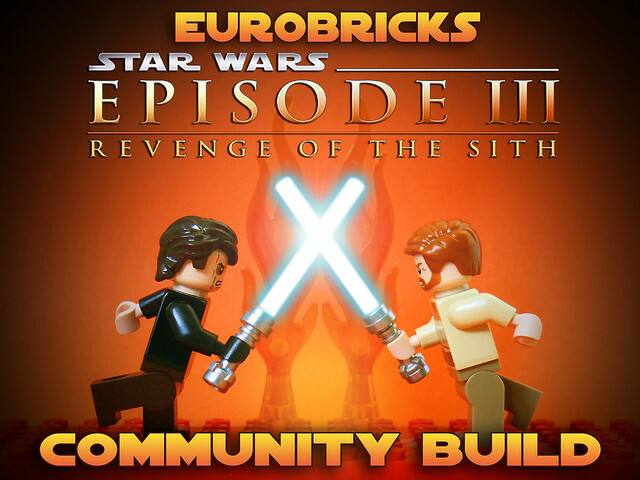 "At last, we will have our revenge..."
Now that the Astromech Workplace contest has been concluded, it's time to get back to our community builds! The last two were huge successes, so let's keep this tradition going with the thrid and last prequel trilogy build, the Revenge of the Sith! Like the previous builds, this is not a contest, just a chance to build with everybody in a common theme. Your entry can be anything in any size and any scale, from vehicles to creatures to vignettes, as long as it relates to Episode III: Revenge of the Sith! When you sign up, please make sure you have an open schedule. The deadline is October 31, 2012. 1) Post your MOC in a separate topic in the LSW forum with the topic tag CBSWIII Revenge of the Sith. 2) Reply to this thread with a picture of your MOC and a link to the entry thread. 3) You may post as many pictures of your MOC as you like inside your entry thread. Pics should be no larger than 800x600. 4) Your entry will be added beside your name in the Sign-ups. 5) You may create as many new MOCs as you want, but please do your best to complete them before the deadline. Admiral-Ackbar - Post Republic Venator Class Cruiser; Trooper Down! I'm in too. Hopefully I'l make more than one entry, ROTS is my favorite PT movie. I'm definitely in too! I missed the first two so this is my chance to contribute to a community build. Sign me up too please Oky, Revenge of the Sith is one of my Favourite Star Wars films. I'll sign up! I'm happy that there's no limit of what we have to do, mainly because I'm not the best MOCer there is out there... but I'll still give it a shot. I will be building several MOCs for this, it's my favorite movie, one's already done. The last one will be my favorite scene. I'm game. Sign me up! I'll make sure to finish my chess set before the deadline this time! A quick question: are we to relate our MOC to the film exactly, or we can, say, place it just in the Ep.III timeline? Custom figs are allowed, I hope? 'Bout time! As always, you can count me in! Excellent! Can't wait to get started! Where do I sign? Don't mind me; I'm just signing up. I'll be back on the last day of the CB with my model. I'm glad to see so much interest again, and that ROTS is the favorite of so many other people. As long as you can relate it to ROTS, it should be fine. For example, if you build a scene of a random guy sitting at home and clipping his toenails and say that he was doing that while Obi Wan and Anakin were dueling on Mustafar, that probably wont cut it, but if you were to, say, show the death of a jedi at the hands of clones during Order 66 that was not shown in the movies but perhaps described in the EU, that would be fine. And yes, all customs are allowed. Just no clone brands please. As you can tell by the past community builds, anything goes, and that includes LDD MOCs, so you should have no problems entering. I need to finish off my clone helmet before starting another build. I should be able to get something out by the 31st Oct though. Count me in, in committed now. Man, by the way you pump out the LDD MOC's you should be able to contribute over 40+ builds for this, LOL . Can wait to see all the final products, we are getting a really good variety of builds and styles in the SWCB. See if we can beat the last number of entrants. In this case, I'm in. Very good then! Count me in!